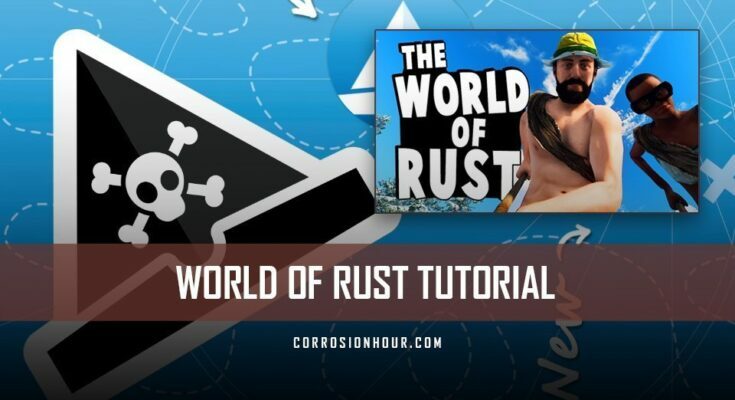 This RUST tutorial video series is brought to you by TinyPirate, who enjoys covering builder, survival, and sandbox based video games. He provides in-depth tutorials, guides, Let’s Play series, and all around fun times for all interested in watching his content. This time around, he’s worked on an updated, in-depth RUST Tutorial Series for 2019, broken apart into four digestible episodes. This post covers The World of RUST, the second episode in a four-part RUST tutorial series. So you’ve chose your server and you’ve hit join, but before you do anything like make amazing plays and dominate those salty noobs (isn’t that what you’re supposed to do in Rust?). Before you do any of that you should probably learn a bit, well actually quite a lot because these tutorials are really long. You should learn a lot about the Rust world. We’re gonna cover the map, the Rust world biomes, and the monuments that scatter the world. The Rust map is a procedurally generated one and the map is comprised of several biomes. The ocean, and some pre-generated structures called monuments. Biomes stretch across the map and bands with usually the snowy area on one side of the map, and the desert areas on the other side of the map. The temperate and forested areas in the middle. You can look at the map for your server by pressing the G key. And when you – thank you merchant ship. And when you press the G key and then mouse wheel – that’s variable time. You can scroll the mouse, or map around. If you hold down — that’s a very noisy magician. If you hold down and right click you should be able to pan and zoom the map around. You’ll notice there are coordinates for each square and players will often talk about where they are in relation to those coordinates. It’s important to remember. And there’s some other interesting features you can see on any of the maps available to you. So first of all, you can see the snowy areas. You can see the temperate green areas, and you can see the desert areas. The next thing you’ll notice is some places are named like lighthouse, gas station, power plant, launch site, and so on. Those are all monuments. Or in the case of mining outposts, or abandoned cabins, these are often called smalluments, as in small monuments. Scattered around any map you’ll also find shopping cart icons, and these are often little shops that are run by players, except for the ones in the Bandit camp, which are run by the Bandits themselves, which are an NPC faction. And there’s also some in the outpost, which I’ll just get to here. Again these are run by the scientist’s faction, and you can visit those as long as you’re not hostile in either of those locations. If you’re not sure where you are, then heading on focus will bring you right back to your person, and heading on the grid will again toggle the grid on and off. Understanding the map and the monuments on it will help you make wise decisions when placing your base, and will allow you to really customize your level of risk acceptance. Who would have thought the exciting world of risk management plays such a big part of your gaming free time? Don’t be surprised if you die while you’re messing around studying the map, and fiddling with settings. But since you’ve made no progress what-so-ever it’s easy enough just to smack a button and re-spawn. That’s just wow, #justrustthings. By the way if you do end up in a team you’ll see your teammates on the map as green dots which can be very helpful. We’ll cover teams another time. So let’s talk a little bit about these biomes and how they differ, and what it means for you as a player. And then we’ll talk about the monuments and why they are important, and how they factor into choosing a base location. If you aren’t yet on a server but know where you’ll be playing, I do advise checking out the server maps, which are easy enough to do on the https://playrust.io website. Really, really handy resource. The biome where you spawn is almost certainly going to be bordering, or is going to be a temperate biome. So the beaches along the temperate biome. On this map, I’d expect that all of these bottom right areas here are probably spawn locations or potential spawn locations. They do tend to be clustered relatively close together. The further you get from this location, the more high sort of value the loot is going to be at the monuments. In this case, the temperate biome occupies most of the middle of the map, and in it you can find wood, you can find hemp plants that we picked up earlier, lots of this stuff should be relatively abundant as well as a little bit of food, and rivers, and what have you where you can find yourself a drink. Also in the temperate biomes you will find mushrooms in and among the trees usually, and they are great, quick, and easy food source. When you pick them up, they just drop straight to your hot bar which is very helpful for you. The next significant biome to talk about is the desert. Desert, as you can imagine, tend to get hot. That’s usually not a big problem during the day, but at night they can get very cold. And if you’re wet and in a desert you will very likely take a lot of cold damage just from freezing. You can mitigate this by starting a fire and wearing warm clothes, but it’s a bit of a problem. So be careful getting wet in the desert. The desert is, as you would imagine, a little low on resources like wood. Although, there are often trees around. You can have a cacti, which will give you a little tiny bit of cloth, and a low amount of food and hydration. The advantages of the desert are that you can generally see enemies coming, and the disadvantages of the desert are that they can also see you coming. So if you want to be hidden in the desert, you’re going to have to tuck yourself away behind rocks or along a cliff edge. If you don’t mind not being hidden, then the desert is a great place to explore and grow because you have a lot of space to place down a base typically. The final significant biome we’ll talk about is the snow biome, which has snow. Yeah. It’s pretty amazing. It’s also very cold. I’ve made some clothes for my character just walking around the server. And if I drag them all of the rag doll, you can see that it is -24, and my health will start dropping quite quickly. As soon as the sun sets below the horizon it is going to get even colder, and if I was to be wet I’d probably be dead within minutes. So yes, the snow biome is a bit of a harder place for people to live. People will choose to live here if they want isolation or if they are perhaps close to an important or valuable site. In this case, living in the snow biome might be worth the risk if you want to raid launch site often, which is a great monument, and hope that perhaps down here will be less players to harass you compared to the perhaps warmer and more temperate locations. I should also mention a couple of the other sort of smaller map features you will notice. The first being beaches. These are where there is sand and the ocean, and it should be a perhaps, no great surprise, that there are also boats here that spawn. That’s very helpful if you want to head out to the sea to do some special looting or adventuring, or re-enacting your deepest pirate fantasies. That’s something we all have deep inside, isn’t it? So there, that’s beaches. Very exciting, isn’t it? The other important feature on a map are rivers. Rivers are helpful because there is food often here. As you can see, I’m just gonna pick these delicious pumpkins and munch on them. There we go. Get some pumpkins inside me. And you also have water that you can drink, so if you walk in here, sort of ankle deep, and look down, you can press E and drink water and hydrate yourself. Animals are also often found spawning next to rivers and generally quite a nice location to hit to if you’re a new player short on food and water. You can find them on the map by looking for these weird, sort of bright blue lines. On this map, there is only one river. Some maps will have a lot more. The final features I wanna talk about are caves. Caves are scattered across the map and usually come with some interesting loot. Commonly as seen here are a bit of fragments. I was gonna be in here, some random player. I might play with that. And tools and low-grade fuel and hats and stuff, and all of this will make sense to you later on. They are pretty cool to explore, but it does get very dark, very quickly, as you see as we go down. So you can either throw these flares out, which will have a limited time or you can whip out your trusty torch. Right click and pick it up. If I get a cool hat like this, I can put it on my head, load it up with a bit of fuel, and press F to turn on my candle hat, or my other torch hat. When you explore the caves it’s relatively easy to get lost, and if you aren’t careful you can also fall down rather vicious holes. There are resources to mine down here, and if you look carefully there are ways to climb out as well. So you see this rock face, you can climb this. As you get further down there are roots and what have you, and you can climb those too. And in this case I’m just going to run all the way to the bottom here, and do a bit of looting along the way. Tools are quite commonly found in the boxes in caves in my experience, so they’re quite a nice little spot to visit if you’re running around looking for your basic gear. There’s a few jump puzzles here and there which I always fail at. And there are actually locations in here where people can build, so some players really enjoy the cave lifestyle because it tends to be pretty secluded. Not many people come down, and it means a relatively secure life, as long as you’re not trapped and cornered like a proverbial rat. So that about does it for a general overview of the Rust map. Hopefully a little bit of exploring on your own will fill in any remaining gaps. Now we’re going to have a little bit of a chat about the monuments. All those big structures that scatter the wilderness. There’s a lot to say about monuments, and really each of them is worth a video all on their own. In fact, as you learn about Rust, and as you get deeper in to the game, you should probably go and search YouTube for any monument you’re interested in or living nearby, and you can find a ton of walkthroughs and puzzle guides. Because yes, some monuments do have puzzles. And that way you can learn a monument inside and out, figure out where all the loot is, and what have you. You can also jump on build or creative servers and fly around and explore monuments in god mode. It can be pretty handy to help you figure out where to go and what to do inside a monument. Or you can do the hard-core thing of actually exploring one in the game and figuring it out as you go. Monuments in Rust offer players access to rare loot and resources, shops, and recyclers to break down unwanted gear. Many players group monuments into tiers ranging from the least attractive to most attractive when it comes to loot or base location. And there is often quite a lot of debate as to which location is going to be best for any particular player. The developers frequently tweak monuments and add new ones, and the relative scale of which is better or worse can change week by week depending on what the current flavor of the day is. I’m going to give you a quick rundown of each monument, roughly in order of challenge and reward, so at least you know what you’re looking at when you browse the map. The smallest monuments on the map, commonly called smalluments, are the gas stations, mining outposts, supermarkets, quarries, and water stations you’ll find scattered just about everywhere. The gas stations and supermarkets and mining outposts have reasonable loot for perhaps smaller groups or new players, and recyclers which are great for scrapping useless junk. The gas stations and supermarkets can spawn green crates which hold quite nice loot if you can catch them before the other players do. A relatively new location is abandoned cabins, which features a couple of small buildings with a little bit of useful loot in them. Next on our list to look at is the lighthouses. This is found on the coast typically, or close to the coast. It isn’t terribly popular. There’s a recycler, there’s some loot, but most players don’t like the distance you have to travel to get to one, and splashing through water can make you cold and ill if you’re in a cold biome. If you see a harbor on the map it could be a large or a small one, they’re both called harbors. They’re both laid out a little differently. Both come with recyclers, oil refineries, and some loot. They’re not terribly popular because they’re both large, and take a little while to fully loot. The junkyard is a relatively recent addition to the game. It’s a monument that is quite linear with little paths running through it. It has okay loot, and a recycler. Not too bad, not amazing. I’m gonna talk about the train yard and water treatment plant at the same time. Both have recyclers and underground tunnels. Both have radiated areas which will require some wooden armor or a lot of clothing to defeat. Both have a reasonable amount of loot, even if it is spread out over quite a large area. Sewer branch is a monument I like the least because there’s a limit jumping puzzle in the middle of it, and I’m really, really terrible at getting to it and it frustrates me because there’s great loot up there. It also has a recycler, and some people really love this monument for the medical crate loot that can be found in the cave at the bottom of the monument. It can be a great boost to the player’s early game. There’s radiation to deal with here too so you do need to dress up to keep yourself alive. The power plant is a big site with a lot of radiation, and you have to be quite careful navigating this area, even with adequate radiation protection. The loot is okay, but fairly spread out. There’s a recycler and a refinery here to make the place a little more useful. Airfield has a lot of great loot and a couple of recyclers but it’s very open and spread out. It’s easy enough to loot a chunk of it on any visit. But looting all of it always feels very risky with lots of exposed running across the airstrip. The two satellite dishes, or satellites as the locals like to call them, have a recycler and some green creates. The relatively small footprint of the site makes it reasonably popular to loot. The dome is a large rusted fuel tank. It’s a small site with excellent loot for those who can make it to the top and back down again safely. It’s quite a popular location to loot so you often hear it being fought over by groups. The military tunnels is a great site for loot but it’s guarded by NPC scientists who you will need to be well armed to overcome. If you do, the loot is quite worth it. There’s a recycler here, but it’s in a shed soaked in radiation. The largest and most impressive monument is the launch site. It covers a very large area and it has a lot of great loot. It’s also guarded by NPC armored vehicle that’s extremely deadly to under equipped or sloppy players. If you can make it to the top of the vehicle assembly building without dying from the intense radiation, there is great, great, loot to be had. But this site is also very popular with larger teams who will fight tooth and nail to dominate the area. There are a few more special sites to talk about. First of all, roads. Roads kind of count as monuments as loot does spawn along them, sometimes guarded by scientists who will very happily shoot you on site if you get too close to them. Roads are commonly stalked by players looking for looting kills, so if you want to a little bit safer while still gathering stuff, you can find junk pile spawns under power lines, and also off the coast on floating and submerged junk sites. We’ll be covering boats and the ocean another time. The two sites where you won’t be getting into fights are the bandit camp, which are a fairly monarchic little community in a swap, and the outpost. The outpost is controlled by scientists and guarded by turrets and the scientists themselves. The bandit camp is guarded by bandits. Put your weapons away before you get too close to either of them. The final special category of monuments is the recently added cargo ship, which turns up and circles the island. You can see it on the map. And it has great loot, but it is guarded by a lot of scientists. Getting on board is definitely a challenge, as is getting the special timed loot box from other players. Congratulations on making it this far through the tutorial. You’re probably still lying on a beach like me hoping that someone doesn’t just stab you to death repeatedly for fun. But never mind, you’re almost, almost ready for the next tutorial. I suggest you go watch it and learn about how to go about setting up your first base. Along the way this tutorial series will also feature optional discussions and kind of panels that you can skip. These are sort of more detail about particular elements of the game, and they’re pretty optional, but they’re pretty fun and interesting I think. So do check them out. If you like what I’ve done, then do share these tutorials around. Consider adding me as a supported creator on the Epic Store, or just become a channel member for the duration of these tutorials, that’d be brilliant. Until next time, I’m TinyPirate, goodbye.